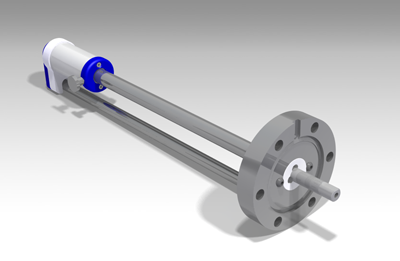 Magnetically driven single shaft linear/ rotary feedthrough with mounting flange DN40CF and rotation lock. Please note: The listed sales price is for customized length items. Please contact us if you'd like a quote for a standard length item. Thank you. The following is a list of compatible options for MD40(RL) Linear/Rotary Feedthrough with Angle Limit. Upgrade from 150°C to 200°C Bakeout Temperature for Single Shaft Wobblesticks and L/R Feedthroughs. Tube Support for MD40 and MD16-ADCF16TS. 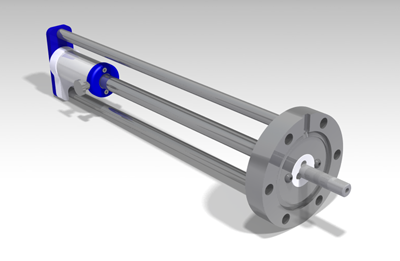 Two parallel 8mm diameter shafts are protecting the tube unit against accidental bending. Single sided tube support for MD16(TS) and MD40. One 8mm diameter shaft protects the tube unit from accidental bending.